The earth makes a complete circle around the sun once each year. From our position, this appears as if the sun were traveling around the earth. In this time, the sun moves through all twelve signs of the zodiac, spending approximately one month in every one. The sign that the sun is found in at the moment of your birth is your sun sign. Tired of reading? You can watch this video instead! The sun is our most powerful planet (in astrological terms, the sun is referred to as a planet even though it, like the Moon, is actually a "luminary"). Even from a great distance, it sustains us on earth, giving us life, warmth, energy, and food. Because of this, the sun is arguably the most important and pervasive influence on your horoscope. In many ways, the sun determines how others see you. It governs your individuality, your specific style, and your motivation to succeed. An understanding of your own sun sign will provide you with an added degree of self knowledge, a deeper insight into the stranger that is yourself. The Traits of your sun sign can be altered and refined by determining what your decante is and whether you were born on the cusp of another sign. The decanate of a sign does not change the basic characteristics of that sign, but it does refine and individualize the sign's general characteristics. A cusp is the point at which a new astrological sign begins. The Sun does not move into a new sign at exactly the same moment each year, and the dates for the different Sun signs may vary by a day or so. With cusp-born people there is always the question, "What sign am I really?" You may feel that you straddle the border of two different countries. To some extent, this is true. If you were cusp-born, you are under the influence of both signs. However, much like being a traveler leaving one country and crossing into another, you must actually be in one country — you can't be in two countries at the same time. One sign is always a stronger influence, and that sign is almost invariably the sign that the Sun was actually in (in other words, your Sun sign). Not everyone will have a cusp. You will only be a cusp if you are born close to the edge of the time frame of your sun sign. Verb for your sun Sign: "I am"
This verb is modified by the zodiac sign the sun was in at the moment of your birth. Choose one of the keywords below to describe the verb "to be." It's happened to all of us: you open a website to read your horoscope and thought “That doesn't fit me at all!” Keep in mind, the Sun sign is only one piece of your character. The Moon and each of the planets also influence you in a variety of ways. With the added environmental and genetic factors, it would be impossible to define the essential you-ness of you by only one factor. You are a unique combination, unlike anyone else. If you think of yourself as a difficult puzzle, your sun sign would be the edge pieces. 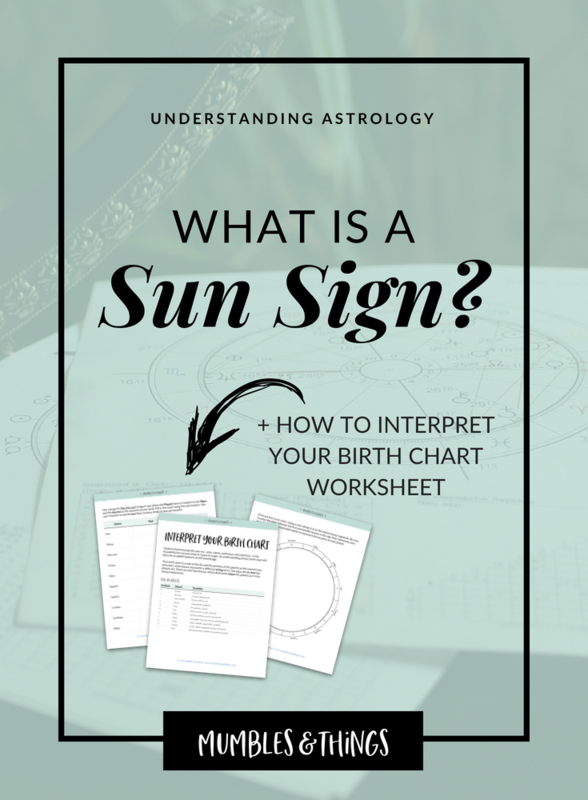 Interpret your entire chart—Sun Sign and all—using this free worksheet. Click the button, enter your info, click the download link, print or save to your computer. Tell me about your sun sign in a comment below. Do you relate to what is listed in this post?